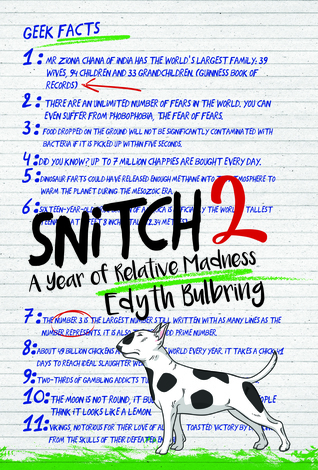 My first response to finishing Snitch 2 by Edyth Bulbring was "Wow! This was fun!" and it's rare to find a YA novel that has that magic combination of wit, humour and just a touch of the absurd. While I don't think it would have been vital to read book 1 first, I reckon it would most certainly help with context. 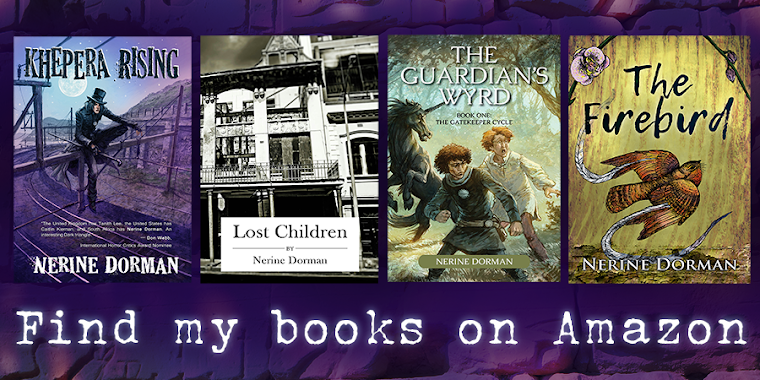 Edyth is clearly comfortable with her characters, and it shows, and I feel that they truly shine in book 2, with the addition of a few more. Most of all, this is a clever book, filled with characters who are all interesting, and who are constantly at cross purposes to each other – with many unintentionally (for them) humorous results. I won't go into the story too deeply, except to say that the Smith household is turned upside down when Uncle Charlie's mom, Gogo, comes to stay. Ben himself hits a rocky patch in his relationship with Elizabeth, whose love for the rescued pitbull Baby puts Ben in second place when it comes to her affections. Not only that, but there's another rival for Elizabeth's attention on the horizon too, and Ben's attempts to get the better of the situation are both painful and absolutely adorable. 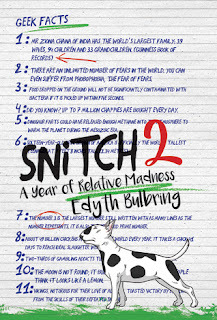 If you, like me, were a huge fan of the Adrian Mole books back in the day, then don't hesitate to pick up Edyth's Snitch books. You'll thank me later. I think what I love the most about Ben Smith's narrative is his sincerity, which is refreshing in a South African climate where we so often fall prey to apathy and cynicism. If you want to be reminded about what makes South Africa such a special place to live, then these stories will rekindle your love. Thank you, Edyth, for this delightful book. You've exceeded my expectations with this funny, joyful story. Snitch 2 is a quick, clever read that will leave readers with a smile on their face. 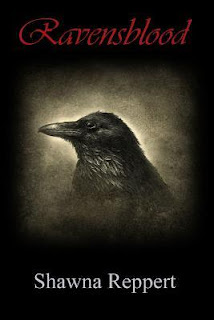 It can be argued that mages in a contemporary setting has been done to death, but there's something about Shawna Reppert's Ravensblood that drew me in. The story has a sort of Harry Potteresque feel, but imagines a world where magic has been normalised – and what the possible impact it would have on society. There's the division between light and dark mages, with enough grey areas between to make me happy that this story had some morally ambiguous areas. And then there's the fact that I'm a sucker for redemption arcs and broody anti-heroes of a gothic bent. Which makes this novel very much a not-so-guilty indulgence for me between other, more serious reads. And if there wasn't a bit of Severus Snape in Corwyn Ravenscroft then I'll eat my magic mouse. This the first in a series, so I'm glad to see there are more books to follow up, as I've grown rather attached to both Cass and Corwyn. 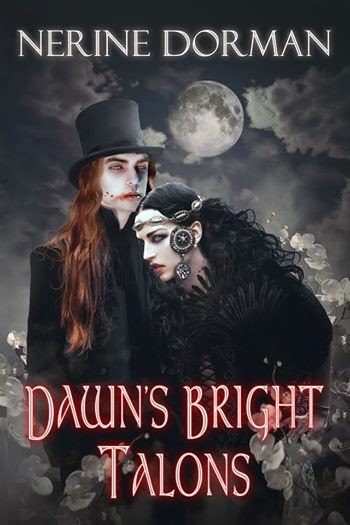 The story thus far is quite simple – Cass lost her taste for dark magic and returned to serving the light – and more specifically the Guardians – a sort of special force to protect society, but she still has a huge stigma attached to her due to her association with the notorious Corwyn – or Raven as she calls him. Cass's partner, Zack, is an Aussie with attitude, but he's a man of honour who stands by Cass when others are quick to judge her. 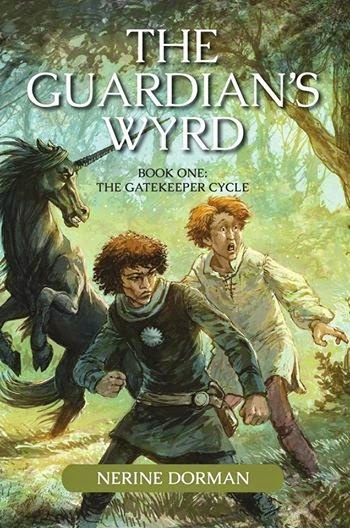 Corwyn is the right-hand man of the dark mage William, who hides behind his magical wards while biding his time to bring about a new age that sees him as the great overlord. Look, I'm not going to spoil what happens, but there's a lovely redemption arc narrative here, with the whiff of a not-quite love triangle. I like the fact that the dark and light mages are portrayed as human – not just convenient caricatures. Not all the good guys are squeaky clean and some of the bad guys are pretty decent people too – just that their outlooks on life set them at polar opposites. And I reckon that's probably what kept me reading. While Reppert doesn't cover any fresh ground in terms of tropes, she tells a good story with heart, and motivated me to purchase book 2 in this series the moment I was done. Consider me invested and looking forward to what happens next. I picked up Mountain of Daggers by Seth Skorkowsky because people were talking it up on the GrimDark Facebook group. 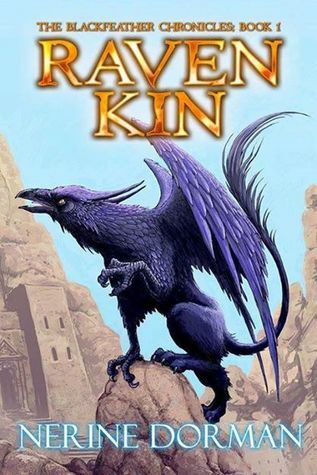 It's a loose collection of tales following the doings of thief and miscreant Ahren, aka the Black Raven, as he goes about his business. Sometimes he's on top of things. Other times his opponents get the better of him. Seth's writing flows along at a decent clip, and he paints a well-realised world that promises to be filled with lore (kudos there). I wanted to nitpick a little but shoved my editor hat under the table, even though I'd have enjoyed having a go at him. 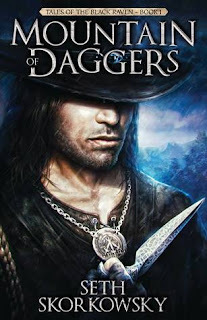 This is still a worthy read though, and if characters with dubious moral inclinations are your thing, with a side order of swashbuckling and getting up to mischief, then you'll enjoy Mountain of Daggers immensely. 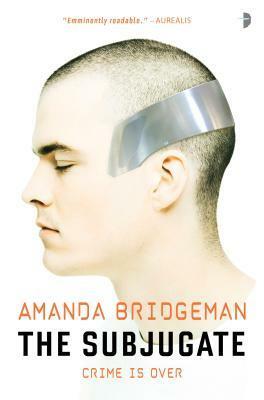 Every once in a while I like to venture outside of my preferred genres, and The Subjugate by Amanda Bridgeman caught my eye. The author paints a vivid picture exploring how technology may very well impact our lives in the not-so-distant future. The world that she envisions means that every movement a person makes is recorded in some way. AIs and self-driving cars are the norm, but police are still required to provide the human element in fighting crime. Yet some people – especially religious communities – have moved away from the city to enjoy more simpler lives, without all the surveillance. But when a murder is committed in Bountiful, a strict Christian community, the case presents detectives Salvi and Mitch with more than their fair share of obstacles. Suspects abound within Bountiful, but things are further complicated by the nearby Solme complex, where dangerous offenders are treated using cutting-edge technology that renders them, as the word suggests: Serene. We follow Salvi's point of view as she unravels the clues that make her doubt even the people closest to her. Hard ethical questions are asked, with no easy answers provided. The story has a slow build, with short scenes that speed up towards a tense conclusion, and I must commend Bridgeman for her stunning misdirection in terms of me figuring out who the killer was. I'm not a huge fan of crime fiction, but I really enjoyed the ride nonetheless. Salvi herself is a difficult character to get into at first, but as Bridgeman gradually reveals Salvi's past, her fanatical dedication to her police work makes all the more sense. There were times when I felt that Salvi herself was emotionally distant, but that could also just be part of her characterisation in that she keeps herself apart from the people and circumstances around her until she can no longer avoid dealing with the issues that challenge her. Except this novel could have benefited greatly at the hands of a developmental editor. It's one thing having a story chock full of tropes. It's quite another if you don't find a way to subvert them in some way to give them nuance and overturn readers' expectations. And it's not just the head hopping that drove me dilly, it's also the shallow writing in terms of character development – there was next to no layering, and the prose is adequate at best. Granted, if you're a huge fan of the setting, and you're into the RPG, you most likely won't be as critical as I am, but truth be told, this read more like hastily dashed off fanfiction than a well-rounded narrative. If the writing had delivered, I would have been won over to enjoy all the Gothic high drama this story packs, but this was not the case. Or maybe I just went into this expecting too much. I don't know. At any rate, I came away disappointed. 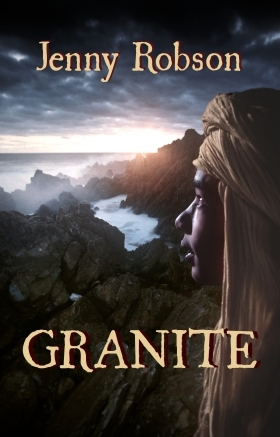 Granite by Jenny Robson is a quick read aimed at younger readers (I'd say about 10-14 or thereabouts) that dips into the world of the young nobleman Mokomba, as he narrates the story of the downfall of the great African city Zimba Remabwe. His version of events is supplemented by the notes shared by his friend Shafiq, whose general knowledge and literacy offers context. The king of Zimba Remabwe tasks Mokomba's father with finding out the secrets of building cathedrals in the style of the "Milk People" to the north, so a party sets out upon a dangerous journey, by land and by boat, until they reach England. What they find there and what they bring back is not quite what they expect, and we are offered the story bit by bit by unreliable narrators until we eventually have the bigger picture. 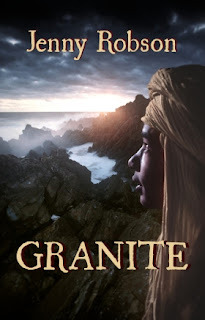 Jenny's writing style is engaging and fluid, and her love of the setting shines through with this telling that brings us an Africa-centred adventure, and a young man's coming of age. My only complaint is that the story is too short – there was so much potential to expand this into something more layered. This is a fascinating glimpse into a world of tradition and history, and I was left wondering what else could have been added to give the story further depth. As it is, this is a poignant read that may spark interest for those who'd like to know more about African history. I won't lie. It took me forever to read The Count of Monte Cristo by Alexandre Dumas. This classic is heavy going, and some understanding of French history during the Napoleonic era won't hurt. I will also admit that I cheated a little and watched the 2002 film adaption of the novel that stars Jim Caviezel and Guy Pearce. I can understand why the scriptwriters made some of the decisions they did. This is a big story, filled with numerous subplots. The short of it is that the young merchant sailor Edmond Dantès has a bright future, except that he is brought down by three people he considers friends, who envy his potential. 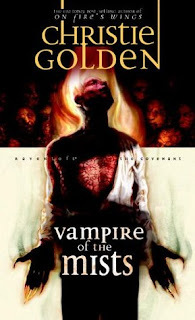 He is locked up for many years in a prison, his identity all but erased, and during that time his betrayers all become highly successful people – one of them even marrying Edmond's beloved Mercédès. While incarcerated, Edmond befriends a fellow inmate, who not only teaches him but bestows upon him the location of a vast fortune. When Edmond eventually escapes, he sets himself up as the rather Byronic Count of Monte Cristo, who returns to Paris to exact vengeance on all who did him wrong. What follows is an epic monstrosity of a novel bloated with subplots and a vast horde of characters to make readers dizzy with all the names and relations if they don't keep notes on the side. How Dumas kept it all straight, I don't know. In other words, this is not a novel I'd suggest abandoning for a while then try to pick up again. You won't just have lost the plot, you'll have dropped it in a fathomless well without any hope of recovering it. Dumas is a keen observer of human nature, and for that reason alone it's worth reading this novel. I suspect the convoluted plot was created precisely so that he could revel in the complicated dance he wove for his characters. One thing that did annoy me, and perhaps it is because of the writing style itself, is that he writes in a shallow third person that verges on omniscient – sometimes addressing the reader. This is purely a writing convention that's a product of its time, but if you're looking for a deeper understanding of a viewpoint character's inner workings, you're not going to get it here – Dumas is deliberately mysterious, often, in order to maintain suspense. 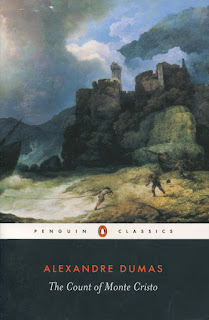 As a template for designing a complex narrative, The Count of Monte Cristo is rich for the pickings, and in that regard I do recommend it to authors who're looking for ideas. I certainly learnt a lot from this. Just be warned, this is not exactly a novel you'll read cover to cover in a week. 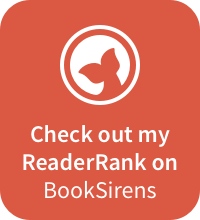 PS, you can pick up a free copy of this over at Project Gutenberg.